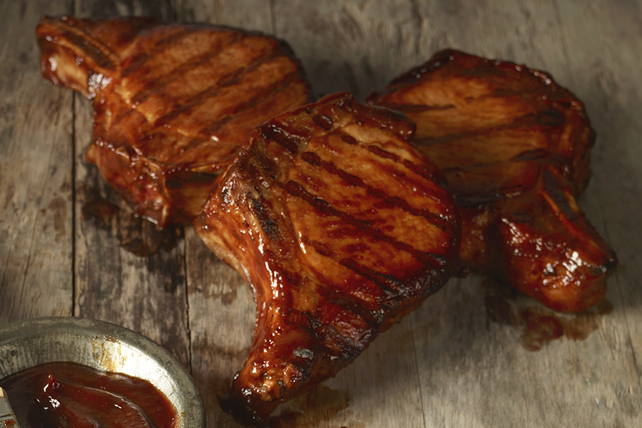 Just follow our 3-step recipe for Perfect BBQ Pork Chops and you'll be on your way to moist, tender pork loin chops in no time. Heat greased barbecue to high heat. Add chops; cook 1-1/2 min. on each side. Reduce heat to medium. Brush chops lightly with barbecue sauce. Grill 7 to 8 min. or until done (160ºF), turning and brushing with remaining sauce after 4 min. The Canadian Pork Council recommends 160°F for an internal temperature on pork. A meat thermometer is a great investment. They are reasonably priced and there is no second guessing if the meat is done. Use a spatula or tongs to turn meat on the barbecue. Never poke the meat with a fork! It causes juices and flavour to escape when can result in dried-out meat. When removing pork chops from the barbecue, always place them on a clean plate. This ensures that bacteria from the uncooked chops will not contaminate the cooked meat.